Guests can book this rate plan for a maximum of 5 nights stay. Guarantee Policy: A valid Credit Card is required for booking. Deposit may be required for special events. Cancellation Policy: Cancel by 3:00 PM local hotel time at least 48 hours prior to arrival to avoid a one night cancellation penalty charge. Non-smoking deluxe guest room with two queen beds with mountain or city views. 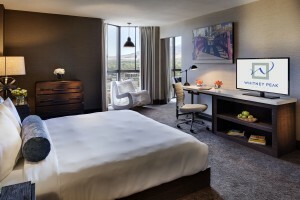 Guest rooms come with a 40” HD flat panel TV, a sitting area, working desk with dataport, complimentary high-speed wireless internet, complimentary bottled water, coffee and tea. ADA accessible guest rooms are available in this room category as well. Non-smoking deluxe guest room with one king bed with mountain or city views. Guest rooms come with a 40” HD flat panel TV, a sitting area, working desk with dataport, complimentary high-speed wireless internet, complimentary bottled water, coffee and tea. ADA accessible guest rooms are available in this room category as well. 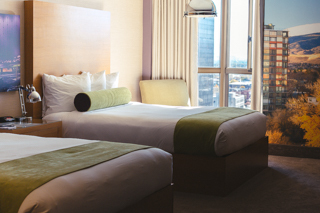 Club Level guest room with two queen beds with mountain or city views come with slippers and robes a 40” HD flat panel TV, a sitting area, working desk with dataport, complimentary high-speed wireless internet, complimentary bottled water, coffee and tea. ADA accessible guest rooms are available in this room category as well. Club Level guest rooms provide exclusive access to the Club Lounge. The Club Lounge at Whitney Peak is an inviting, beautifully appointed space that is your place for a heightened level of comfort and privacy. Often referred to as a "hotel within a hotel," the Club Lounge is the ideal place to conduct business, find a quiet spot, or simply unwind. 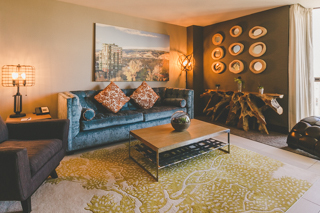 With floor-to-ceiling mountain views, the club lounge brings the creature comforts of the home into your hotel stay. 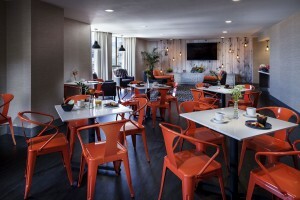 Club Level guests have access to complimentary breakfast, comfy furniture, 65" HDTV's and a comprehensive selection of beer, wine and hors d'oeuvres served nightly by our dedicated Club Level staff. Whether you are staying for business or pleasure, the Club Lounge is that exceptional hospitality experience you are looking for in your next hotel stay. 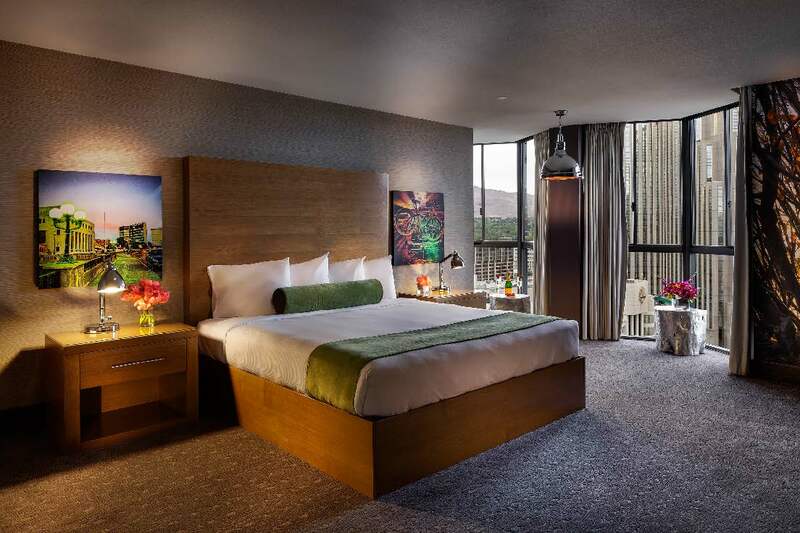 Club Level guest room with king bed with mountain or city views come with slippers and robes a 40” HD flat panel TV, a sitting area, working desk with dataport, complimentary high-speed wireless internet, complimentary bottled water, coffee and tea. ADA accessible guest rooms are available in this room category as well. Club Level guest rooms provide exclusive access to the Club Lounge. The Club Lounge at Whitney Peak is an inviting, beautifully appointed space that is your place for a heightened level of comfort and privacy. Often referred to as a "hotel within a hotel," the Club Lounge is the ideal place to conduct business, find a quiet spot, or simply unwind. 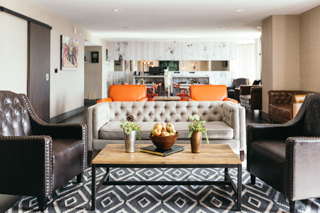 With floor-to-ceiling mountain views, the club lounge brings the creature comforts of the home into your hotel stay. Club Level guests have access to complimentary breakfast, comfy furniture, 65" HDTV's and a comprehensive selection of beer, wine and hors d'oeuvres served nightly by our dedicated Club Level staff. Whether you are staying for business or pleasure, the Club Lounge is that exceptional hospitality experience you are looking for in your next hotel stay. Non-smoking Club Level Executive Suite with one king bed with mountain or city views. Each suite offers a separate living room, spacious bedroom with a King bed and one bathroom. Additional in-room amenities include 46” HD flat panel TV’s, separate parlor, refrigerator, microwave, bar, complimentary high-speed wireless internet, slippers, robes, complimentary bottled water, coffee and tea. ADA accessible guest rooms are available in this room category as well. All Guest Room Suites at Whitney Peak Hotel provide exclusive access to the Club Lounge. The Club Lounge at Whitney Peak is an inviting, beautifully appointed space that is your place for a heightened level of comfort and privacy. Often referred to as a "hotel within a hotel," the Club Lounge is the ideal place to conduct business, find a quiet spot, or simply unwind. 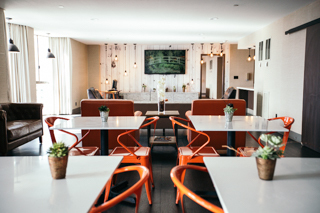 With floor-to-ceiling mountain views, the club lounge brings the creature comforts of the home into your hotel stay. Club Level guests have access to complimentary breakfast, comfy furniture, 65" HDTV's and a comprehensive selection of beer, wine and hors d'oeuvres served nightly by our dedicated Club Level staff. Whether you are staying for business or pleasure, the Club Lounge is that exceptional hospitality experience you are looking for in your next hotel stay. Non-smoking Club Level Executive Suite featuring two bedrooms each with one king bed with mountain or city views. Each suite offers a separate living room, and 2 spacious bedrooms with a King bed and one bathroom in each room. Additional in-room amenities include 46” HD flat panel TV’s, separate parlor, refrigerator, microwave, bar, complimentary high-speed wireless internet, slippers, robes, complimentary bottled water, coffee and tea. ADA accessible guest rooms are available in this room category as well. All Guest Room Suites at Whitney Peak Hotel provide exclusive access to the Club Lounge. The Club Lounge at Whitney Peak is an inviting, beautifully appointed space that is your place for a heightened level of comfort and privacy. Often referred to as a "hotel within a hotel," the Club Lounge is the ideal place to conduct business, find a quiet spot, or simply unwind. With floor-to-ceiling mountain views, the club lounge brings the creature comforts of the home into your hotel stay. Club Level guests have access to complimentary breakfast, comfy furniture, 65" HDTV's and a comprehensive selection of beer, wine and hors d'oeuvres served nightly by our dedicated Club Level staff. Whether you are staying for business or pleasure, the Club Lounge is that exceptional hospitality experience you are looking for in your next hotel stay.